I’ve got a problem. I stress-eat. And, lately, with all the upheavals in my life, I’ve not been eating in the most healthy manner. I’m a bit scared to step on a scale, because I’m pretty sure that all the great things I’ve accomplished in the last year are rapidly unraveling. So, I’m trying to figure out how I can step back and reduce my tendency toward stress eating — and perhaps get back on track with my efforts to live a healthy lifestyle. Stress eating is often the result of not paying attention to what you eat. Or, if you do pay attention to what you eat, you aren’t paying attention to the why behind it. Mindful eating can encourage you to take a step back and examine your motivations. When I’m stressed, I’ll keep eating whatever’s handy. Even if I don’t particularly like it. I don’t actually like Peanut M&Ms all that much. But when my life is turned upside down, and I’m wandering through the house trying to manage all the stress, I’ll eat handful after handful of those things. Stress eating can also manifest when you keep eating — even if you aren’t hungry. Eating is your coping mechanism, and it’s something that can destroy all of your hard work toward health if you don’t recognize it for what it is. Once you realize that you are stress eating, you can take steps to mitigate some of the results. If you just need something to chew on while you are stressed, the next step is to get used to choosing foods that are healthier. Healthy snacking is better than sitting down with a bag of chips. I’m working on this method of stress eating right now, because I’m having a hard time stopping eating altogether. But it’s still difficult for me right now. Even though I’ve got grapes and baby carrots and yogurt-covered raisin readily available, sometimes I’ll still go hunting through the freezer for cookie dough or dig out some sub-par chocolate from somewhere. But I’m getting better about it. When I realize what I’m doing — when I force myself to be aware of my stress eating habits — I stop rooting around for junk food and reach for the healthier snacks. Finally, it’s possible get a handle on the stress eating when you reduce your stress level. Since eating is a coping mechanism, it’s a good idea to find a different mechanism. Exercise is a great stress reliever, and there are short workouts that can help you feel good, without the need to eat. Self massage: Give yourself a little massage. Studies indicate that self massage can reduce your stress levels and even boost your productivity. Two of the easiest ways to accomplish this are to massage your hands when you put on lotion, and to roll your feet over a tennis ball. Drink black tea: Studies indicate that black tea can help reduce stress by reducing cortisol (a stress-related hormone) and reducing your cravings for food. Meditation: You can even do a one-minute meditation to reduce your stress level and help you refocus so that you can cope better — without food. Aromatherapy: The scents you have around might help you relax better so that you have the ability to fight of stress eating tendencies. Lavender is considered a great choice. When you find yourself in the kitchen, and you really don’t have a compelling reason to be there, do your best to stop in your tracks. Grab a handful of nuts, and then go do some yoga. Or, perhaps, give yourself a hand massage while you wait for a cup of black tea to finish steeping. Look for something to do other than eat unhealthy foods. 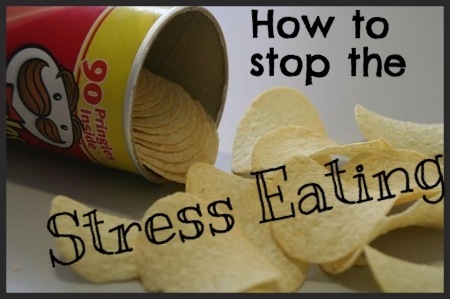 Do you have problems with stress eating? What are some of your strategies for reducing the urge? I’m guilty of this also. I love the thought of using Aromatherapy. I’m going to give this a try!